You have probably used a porta potty once or severally in your lifetime. A porta potty or simply portable toilet is a modern-day outhouse. It can be a basic outdoor stall that is installed at a concert or a lavish portable restroom that is rented for a special event. 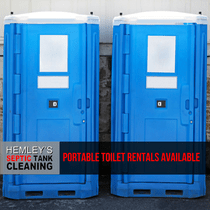 At Hemley’s Septic, we offer porta potty rentals in Tacoma for various events and occasions. We know that portable toilets can break or make the success of your event. But, many people don’t give them a second thought while planning events. Whether you are setting up a new construction site or planning an outdoor occasion, remember that the selection of a porta potty can mean everything to your workers or guests. 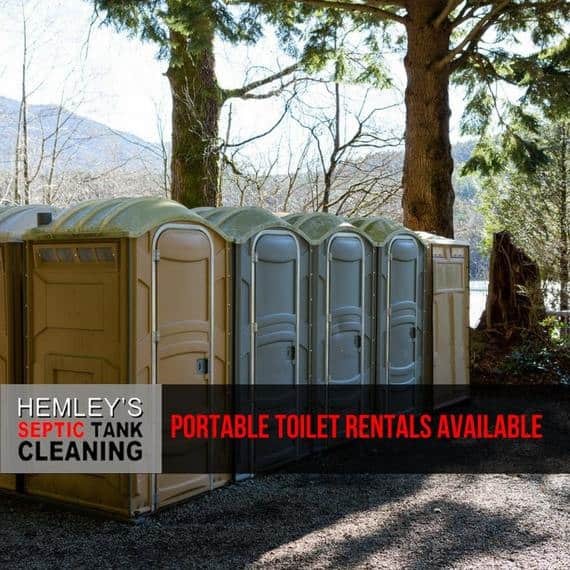 ​Hemley’s Septic is a privately owned septic company that has been providing portable toilet rentals in Tacoma and the surrounding areas for years. We are a team of highly qualified professionals that take pride in the provision of quality sanitary solutions to our clients. Our goal is to enhance living standards, protect the environment, as well as ensure safety, health, and comfort of our clients and their workers or guests. We offer a wide range of portable rentals including restroom trailers, porta potty rentals, freshwater systems, and shower trailers. Many people are familiar with small portable restrooms that are constructed with lightweight materials. These are mostly used on construction sites and at outdoor events as temporary toilets. They are easy to move from one location to another. Majority of our porta potties come with antibacterial hand sanitizers and a toilet paper. You can also rent our porta potty with a separate hand washing station. This station includes paper towels and soap. Since a porta potty doesn’t use the traditional plumbing, it comes with powerful deodorizers that manage and disinfect waste. These deodorizers give porta potties the blue color of the liquid that is found in porta potties. Where you place your porta potty is another important factor that will influence the success of your occasion or performance of workers at your job site. Basically, placement is a crucial factor to consider when choosing your porta potty rentals in Tacoma. Portable toilets should be placed at a dry, level, and central location. They should be situated at a place where every worker or event attendee can access them with ease. Ideally, individuals should not travel long distances while looking for a portable toilet in your event venue or job site. For most occasions, it’s sensible to place porta potties close to high-traffic areas. These include near crowd seating or food stands. After narrowing down a convenient placement, make sure that your portable toilets stand within 25-40 feet of pump truck service access. For handicap-access portable toilets, make sure that people that use wheelchairs can access them with ease. Hemley’s Septic provides handicap-access portable toilets in Tacoma too. Book your portable toilets now! Are you planning an event or a job site? Then take a minute to explore our website and select the most appropriate portable toilets for your site or venue. Call us any time to book or to inquire about our porta potty rentals in Tacoma. Thank you for contacting Hemley's Septic. Please standby for a phone call from our office staff momentarily if during normal business hours. If after hours, we look forward to reaching out to you the following business day. Thanks again for contacting Hemley's Septic, we look forward to doing business with you! - And so many more! © 2019 Hemley's Septic | All Rights Reserved.